OHCHR in Geneva, where the CAT meets. 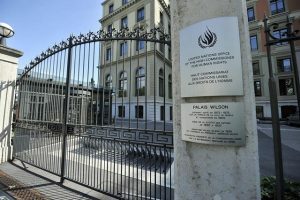 The World Organisation against Torture (OMCT), International Partnership for Human Rights (IPHR) and the Institute for Peace and Democracy (IPD) have submitted a joint report to the UN Committee against Torture (CAT) ahead of its adoption of a list of issues for its next review of Azerbaijan. The report is primarily based on information provided by organizations, lawyers and activists on the ground who wish to remain anonymous for security reasons. The report covers issues such as the lack of investigations and convictions for the use of torture; harassment, arbitrary detention and ill-treatment of human rights defenders, activists and journalists; restrictions on the operation of civil society organizations and the independence of lawyers; arbitrary detention and ill-treatment of LGBTI people; and the lack of independence of the national preventive mechanism. It also highlights concerns related to the so-called Nardaran case and conditions in Gobustan Prison and arrests and killings on front lines. The report provides recommendations for questions that the Committee should raise with the Azerbaijani authorities. The CAT will adopt the list of issues on Azerbaijan at its 63rd session, which will take place in Geneva from 23 April to 18 May 2018. The Azerbaijani government will be expected to address these issues in its subsequent periodic report to the Committee about its compliance with the Convention against Torture and Other Cruel Inhuman or Degrading Treatment or Punishment, which is due in 2019. The CAT last examined Azerbaijan in November 2015. The joint NGO report to the CAT can be downloaded here.